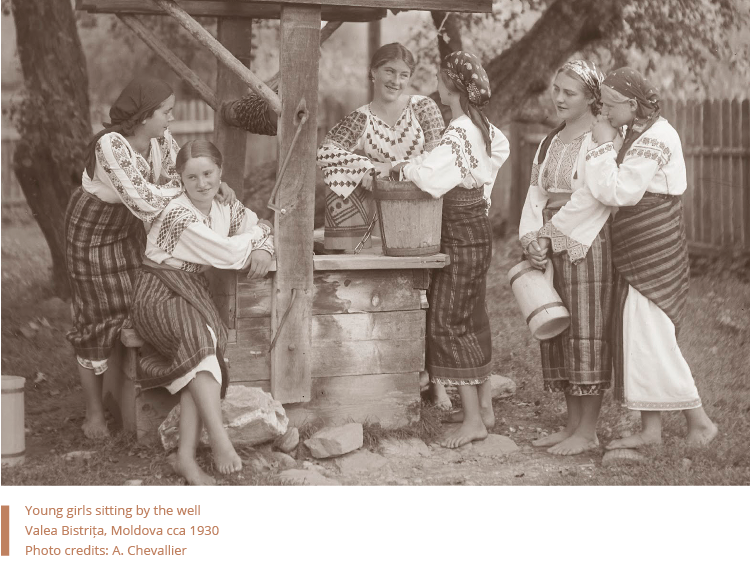 To the outsider’s eye, the folkwear ensemble might signal belonging to the ethnographic area it originates from — perhaps even the specific region of Transylvania, Moldova, Muntenia Oltenia, Crisana or Banat, as well as membership to an ethnic community — whether Romanian, sasi (german community settled in Romania), secui (Hungarian community settled in Romania), roma, tatăr (Turkish-originating community) and so on. To the peasant’s eye — and heart — folkwear signals gender and age differences, kinship relations, marital status, wealth and social status, occupation — and of course, style. Folk outfits were — and still are — vehicles of functional and as well as symbolic communication. 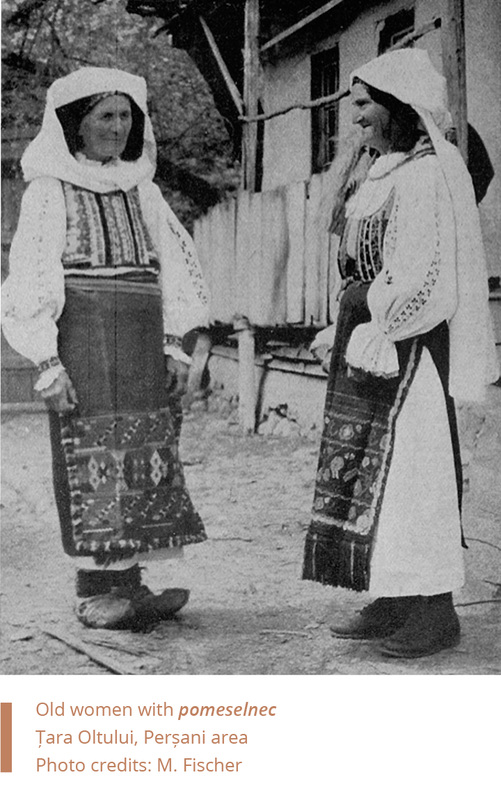 It is hard to pinpoint a categorical typology of the folk outfit throughout Romania – even judging by ethnographic areas: sometimes, within the same ethnographic zone, one might find various styles of folk blouses or types of aprons, as well as decorative patterns, depending on the interactions with neighboring communities. In fact, the borders of any ethnographic zone will produce interesting hybrids between the different villages. Moreover, the presence of regionalisms makes it difficult to keep track of variations – the same word might refer to two different things from village to village. 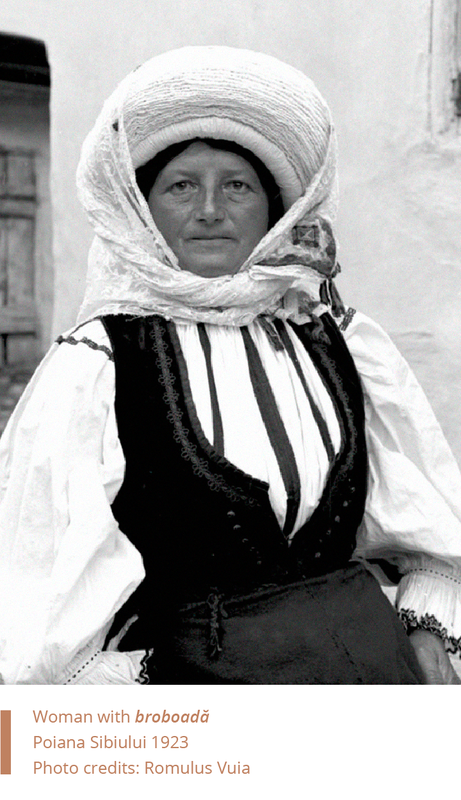 However, there are general similarities in regional folkwear that allow us to grab onto some points of departure – most ethnographers choose to categorise according to the type of ensemble, judging by the lower body covering, or go into the detailed tailoring style of the folk blouses and the embroidered motifs distribution on the sleeves. — The body of the blouse — usually referred to — with regional differences — as stan, denoting both the front and the back side of the shirt. — Originally, the stan came together with the lower side of the dress, poale — which essentially acts as an underskirt, but became a separate item with time. 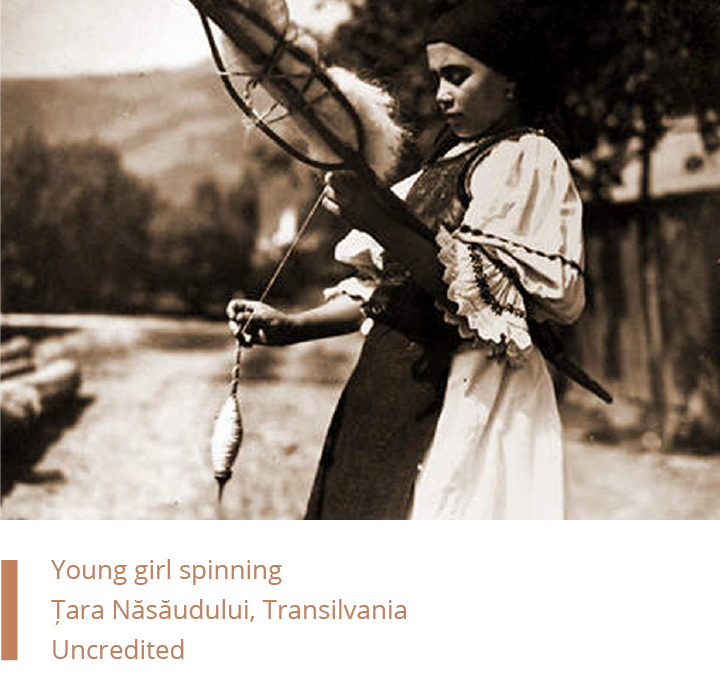 In certain areas of Romania, such as Tara Oașului, northern Transylvania, the upper body has always been separated from the poale, which go by the name of pindileu. — The covering of the underskirt — by catrințe (two rectangular straight aprons), fote (wrap-around rectangular skirt) and vâlnice (pleated or gathered wrap around skirt) — or combinations of the above. — Headwear and subsequently, special hairstyles. 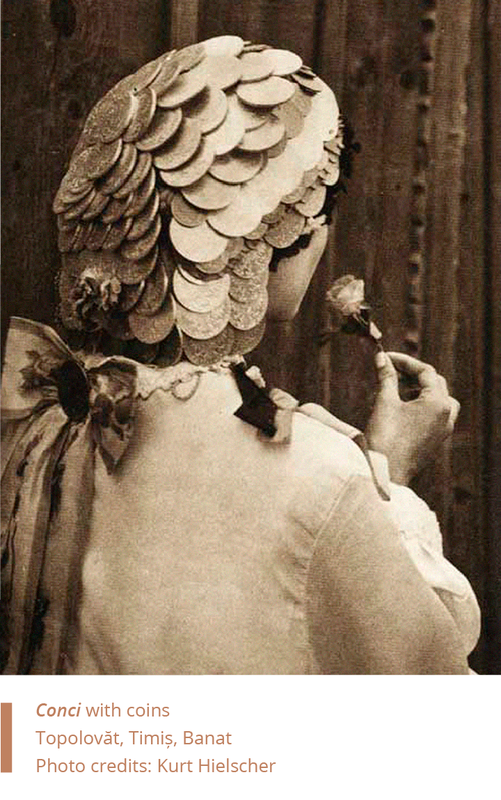 Headdressing was never random — in fact, it is one of the quintessential signs in reflecting the marital status of a woman — as well as social and economic status, depending on the addition of silver or golden coins in the headdress (such as the conci cu monede — bonnet with coins, specific to certain areas of Banat). 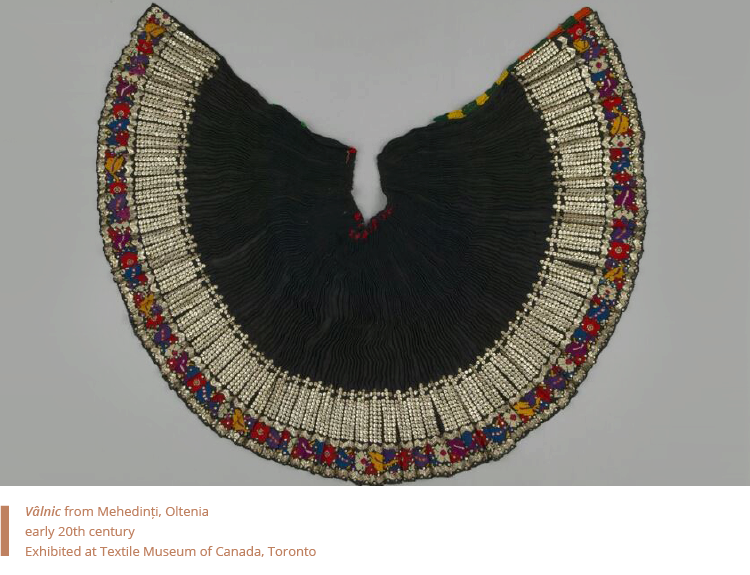 The tailoring and cut of the blouse — more so than the decorative motifs embroidered– reveal hints as to what ethnographic zone, ethnic community and social status they once belonged to. 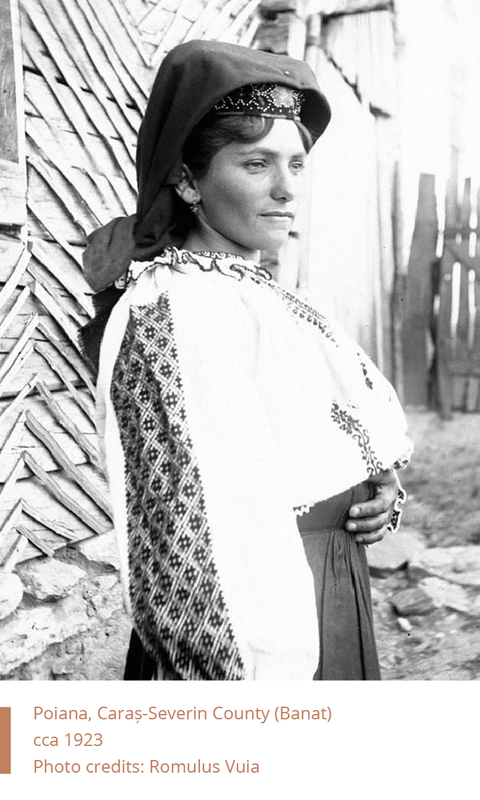 The composition of a blouse is made out of the body of the blouse (stan or ciupag), the sleeves — which can be gathered at the neckline together with the fabric used for the body of the blouse, or set-in at shoulder level — and the gussets (clin or pavă) placed in the underarm area to ensure carefree mobility. The type of finishing of the sleeves is very diverse, yet one thing is for sure: whatever shape it takes, the sleeve is always voluminous. The sleeve can be left wide open in a bell sleeve, taper towards the wrist in an embroidered cuff (brățară), or finish with dramatic ruffles (fodori, bezer) that can flare from elbow or wrist level. 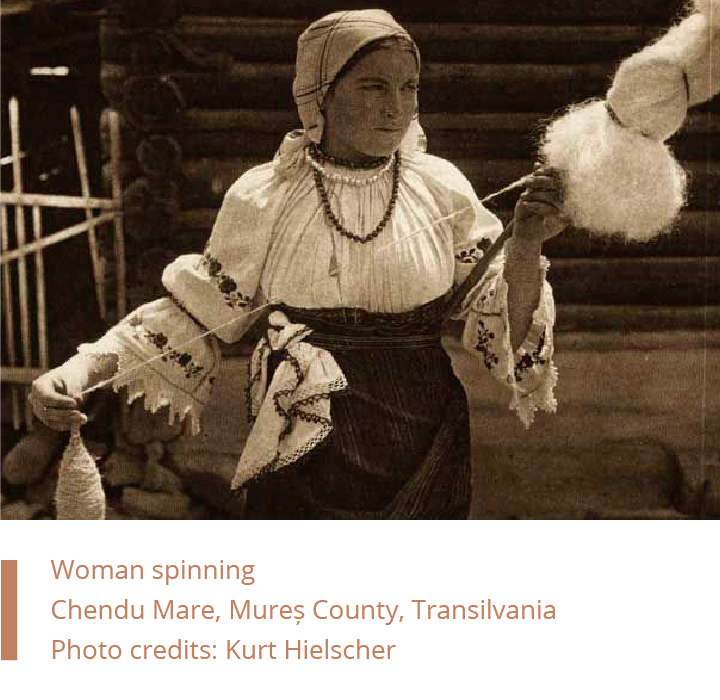 Also known as cămașa dreaptă, zoroclie, cămeșoi – meaning the olden shirt or “straight” blouse – where the back and the front of the blouse are made from one piece of fabric, “poncho style”. 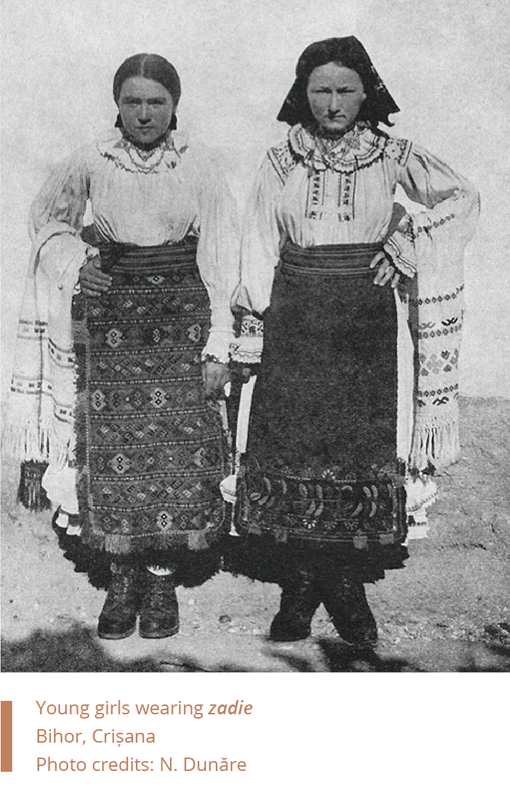 This type of blouse is believed to precede the more iconic ie – however, cămașa bătrâneascăstill coexists with ia across the Romanian territory – with variations of the blouse appearing in Tara Oașului, Maramureș, Crișana, and Dobrogea. 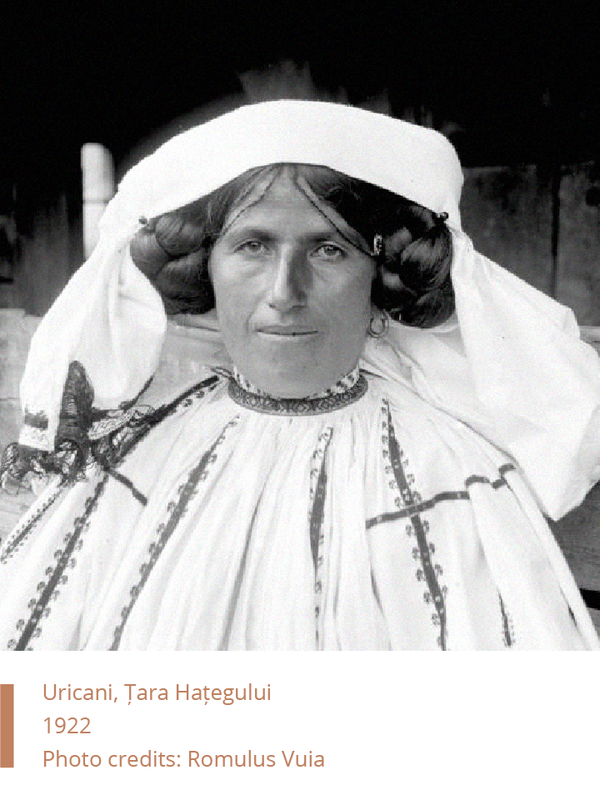 Ethnographers often include the square collar blouse specific to Maramureș, that with umeraș or with cheptar specific to Tara Oașului, cămașa cu chiept specific to Tara Lăpuș or the cămașa cu ciupag of the Apuseni Mountains. 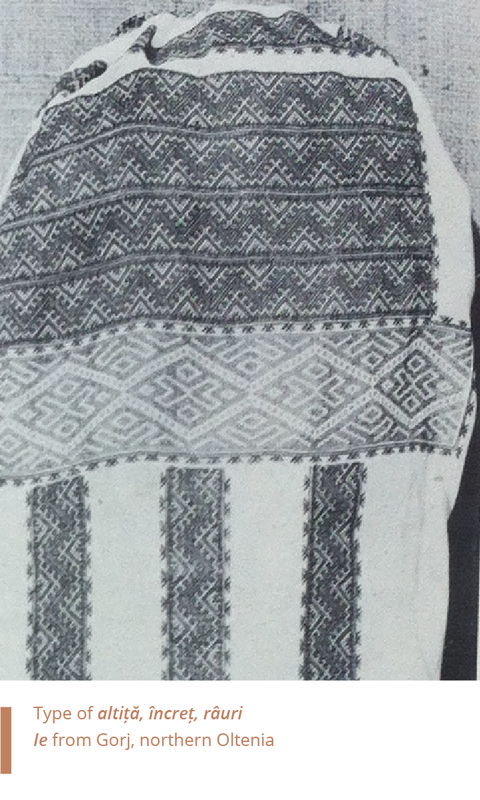 Also known as cămașa încrețită or the Carpathian blouse. 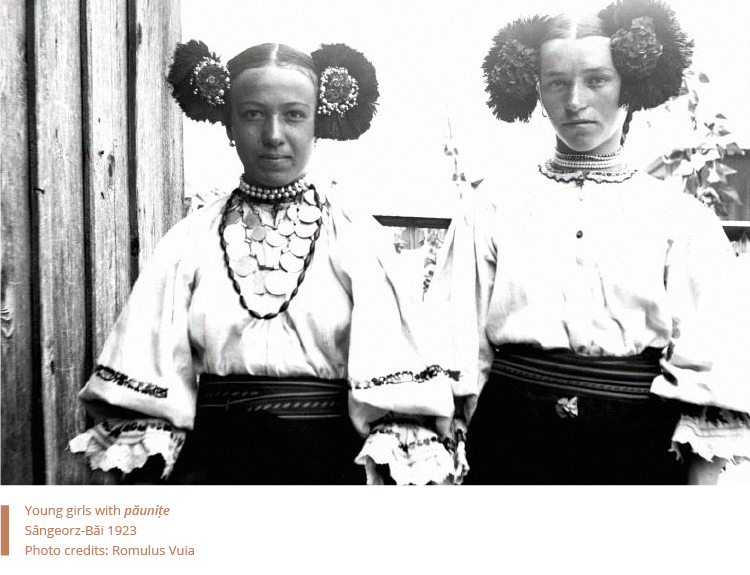 This is the most iconic item of the Romanian folkwear, renowned for its subtlety and finesse and for the graceful distribution of embroidery on the crisp-white blouse. The word ie originated from the latin tunicae lineae, and the alternative name cămașă, cămeșă, from the Gaelic camisia. 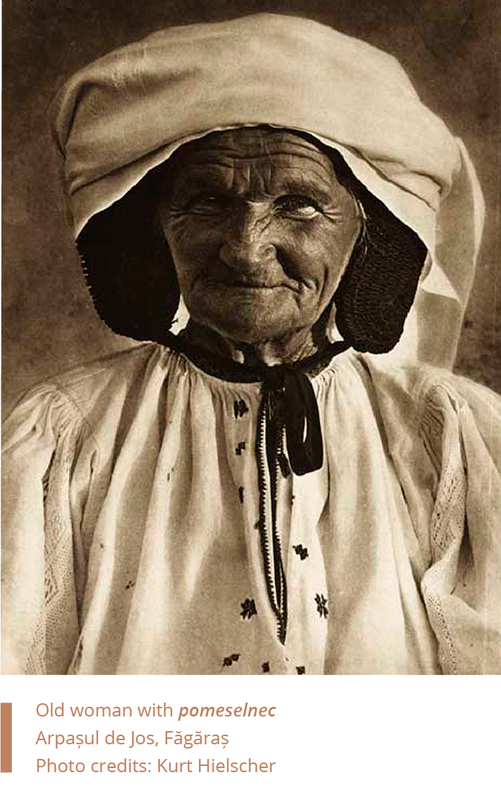 While cămașă can refer to both a woman’s and man’s blouse, “ia” strictly refers to the woman’s. Traditionally, ia is made out of 4 rectangular folds of fabric – thus producing no waste – and 4 more additional smaller rectangular pieces that will serve as gussets. The tailoring scheme for the ie changes only slightly across time. 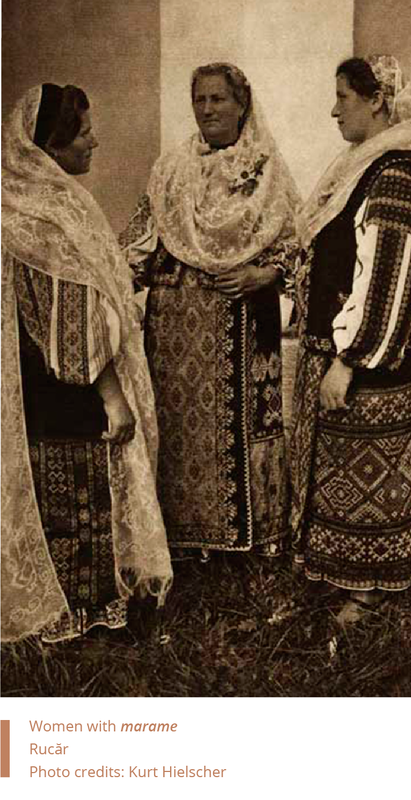 The front side of the blouse, pieptul (the chest) of the shirt, is usually decorated with either subtle vertical rows of motifs (Transylvania and Moldova areas), either more complex, stuffy ones (such as in the case of Muscel, Arges, Valcea, Mehedinti ones). Depending on the local traditions and canons, there are certain ornamental systems that help build the picture of different types of blouses – when it comes to ii, it’s all about the sleeves. Traditionally, the visual composition of a sleeve is made out of: altiță+ încreț+ râuri, ending with either an open bell-type sleeve, an embroidered cuff, or with ruffles flaring out at the wrist. 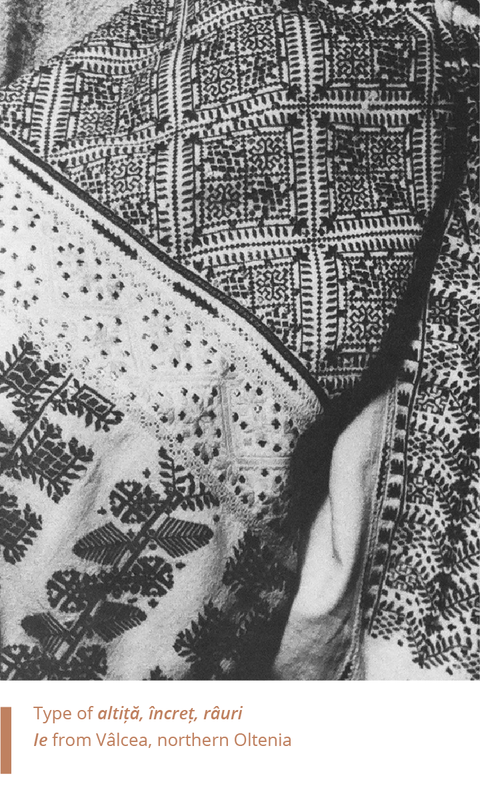 The altiță used to be a separately embroidered piece of rectangular cloth added to the shoulders of the blouse, whose function was to cover the addition of another cloth fold to the sleeves. 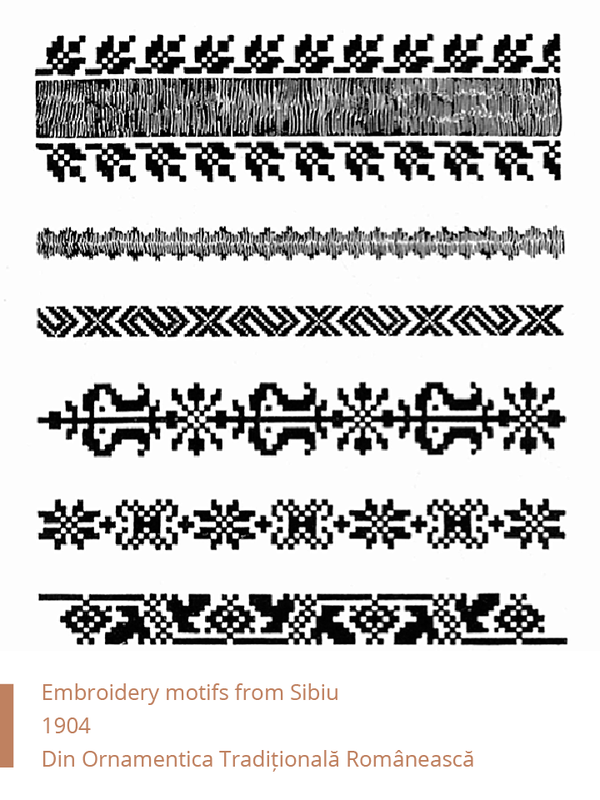 Altița was initially a very thin band (and it has so been preserved in some Transylvanian ethnographic zones, for instance, in southern Transylvania where it is also called pui peste umăr, umeraș) but with time evolved into a complex decorative section of the sleeve (predominately in the areas of Muntenia, Oltenia and Moldova). 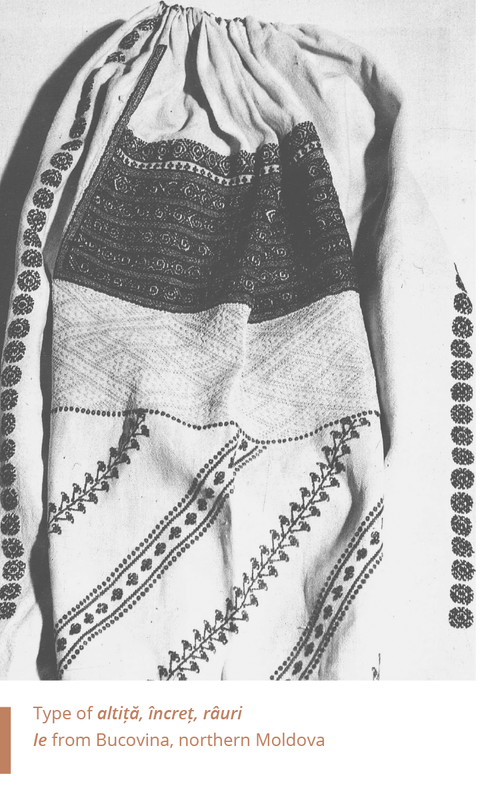 The symbols embroidered onto the altiță were unique, not to be found anywhere else on the blouse – as opposed to the râurion the sleeve, which used motifs repeated on the front and backside of the blouse. 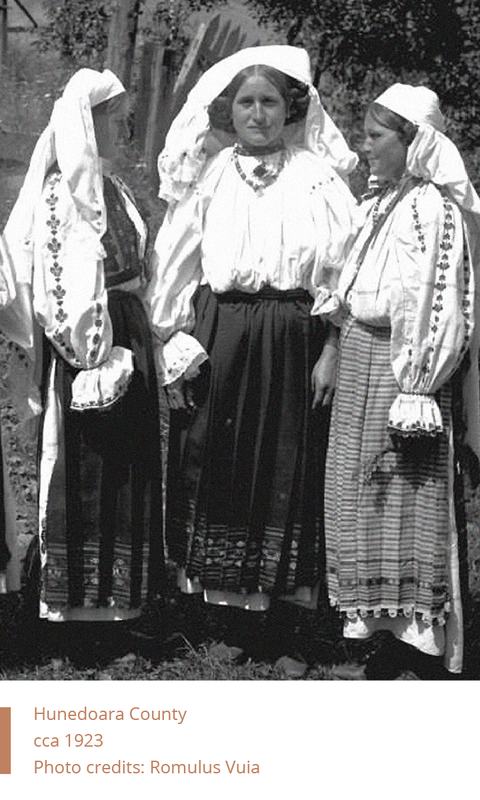 Judging by the presence and form of the altițăon various local folk blouses, one can differentiate between folk blouses with altiță, and folk blouses without altiță. The încreț initially served the functional role of gathering the wide pieces of fabric together in a subtle crease underneath the altiță. The type of symbols embroidered unto the încrețare geometrical: rombul (diamond-shaped), cârligul ciobanului, (the shephard’s hook, S-shaped), coarnele berbecului (the ram’s horns). Both the altițăand the încreț lose their functional roles throughout the 19th century but are preserved as decorative elements. Colours of the încreț vary between white, light yellow, or red – with light blue as a later addition. Literally, rivers. Refers to the ornamentation embroidered on the sleeves, flowing down from the încreț all the way to the lower edge of the sleeve. There are two types of distribution of the decorative rows: they can be displayed vertically, drepte (straight) or diagonally: oblice, săbiate, costisate, chiezuri etc. — cu tablă: literally, panel-like — all the râuri are compactly gathered within a rectangular panel that begins at shoulder length and continues to the cuff. Usually, the same vertical lines of motifs are repeated. 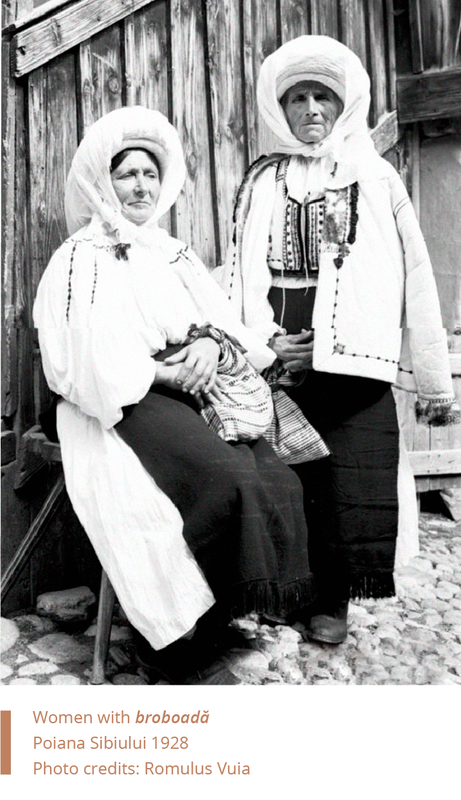 Specific to the ethnographic areas of Banat, Hunedoara, parts of Bihor (Crișana) — these folk blouses display no altiță. There is, however, a combination of altiță and tablă-like embroidered râuriin parts of Muntenia — especially Muscel and Argeș. — flori sărite — literally translated to skipped flowers, individual embroidered motifs, displayed in an isolated yet symmetrical manner. 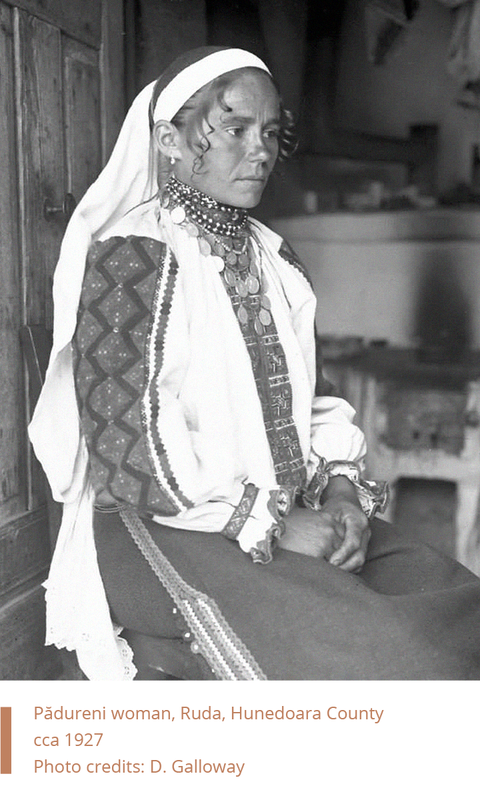 This type of folk blouses also rarely display an altiță. There is a widely various stylized sign and symbol vocabulary that is embroidered onto the blouses – ornamental motifs can either be entirely geometrical, or stylized interpretations of the surrounding environment: flowers, plants, animals, humans (zoomorphic, anthropomorphic motifs). 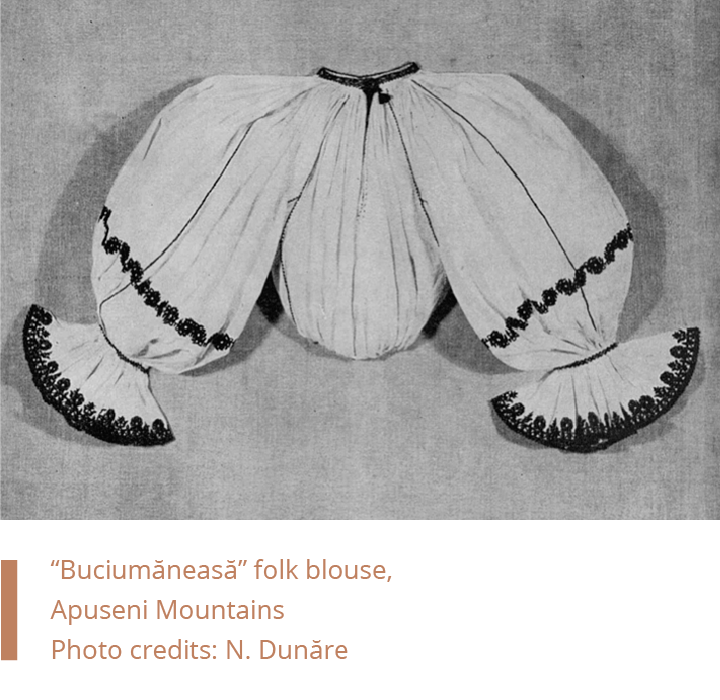 The blouses within the Carpathian mountainous chain – Transylvania – are much more subtle. 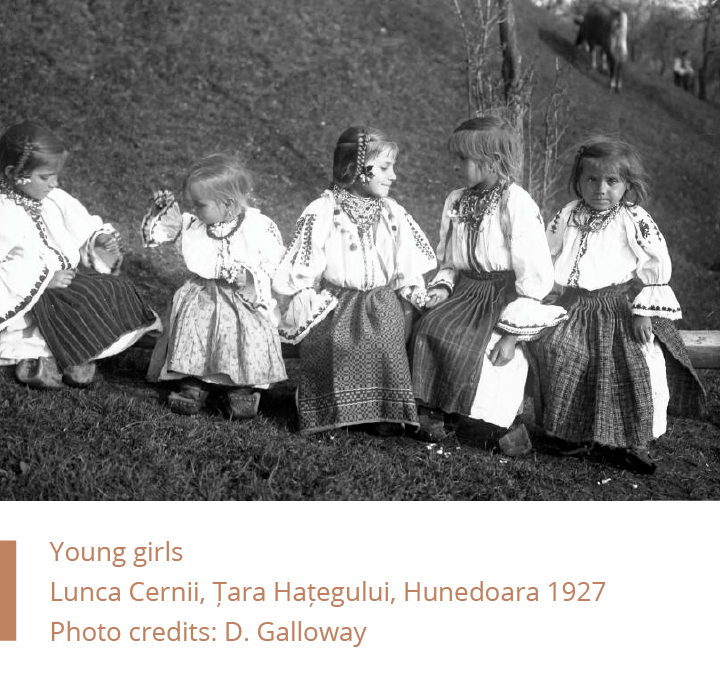 Albeit gathered as well, they display subtle râuri and allow for more white space – some argue that Transylvanian folkwear preserves the archaic feeling most. The fabrics are thicker (given the mountainous, colder climate) and the ornamentation finer. 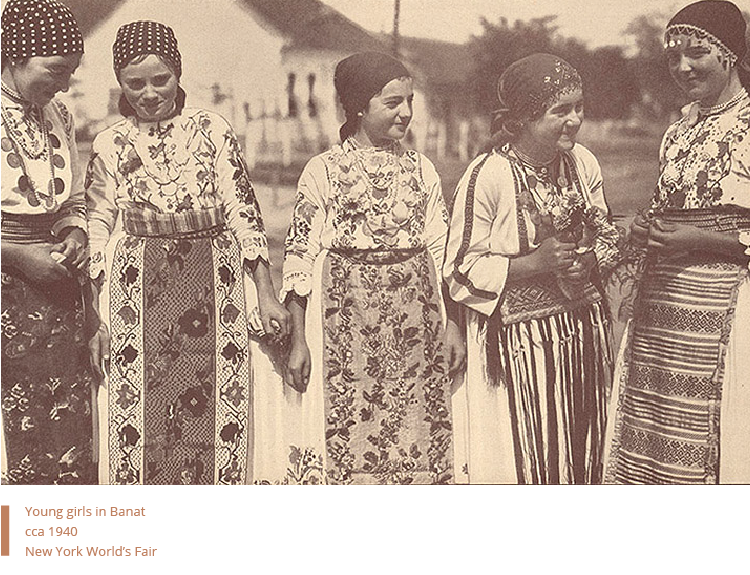 With the exception of the southwestern part of Transylvania (Banat) and northern Muntenia (Argeș, Muscel), the addition of sequins or metallic threads is very rare. Types of such ii specific to the Transylvanian zones include an altiță (pui peste umăr, umeraș)and șire (râuri) across the sleeve. 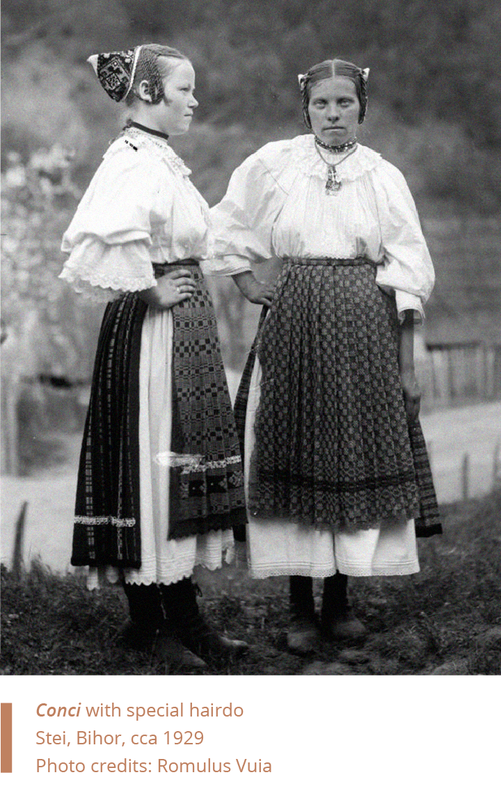 Such wide, voluminous sleeves, without altițe and with sparing horizontal thin lines of embroidery at elbow level – are specific to most regions of Transylvania: Năsăud, Lăpuș, Sălaj, Mureș, Cluj, Apuseni, Hunedoara, Făgărași, Târnave. The sobriety of these shirts is, in certain areas, balanced with the heavy chest embroidery ciupag – the embroidery within and above the creases made at chest-level. 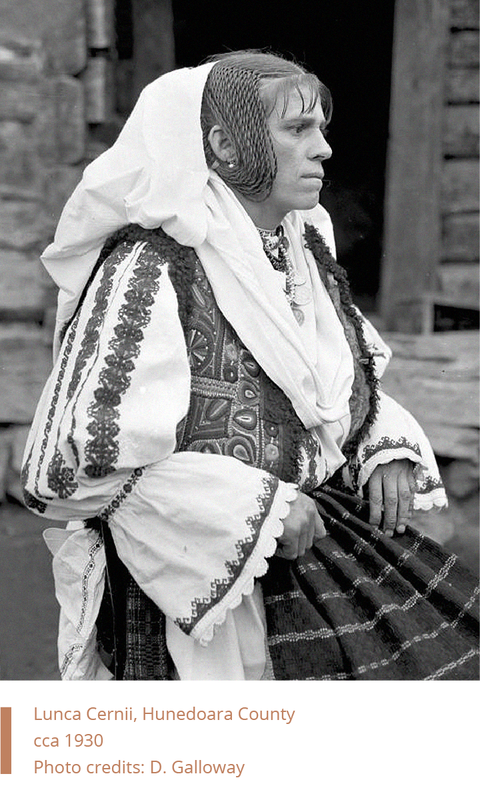 The areas where one could find such blouses extend from the Aries Valley of the Apuseni Mountains, (ethnographically inhabited by a community called buciumani) all the way diagonally across the plains of Transylvania, to the land of Năsăud& Lăpuș. This is also a type of stitching and sewing on top that one can observe at the Saxon communities in Transylvania, albeit executed in a different technique. The most common cover-up throughout Romania, catrință (with its plethora of local denominations, from șurț (central & southern Transylvania), păstură (Tara Oltului, FăgărașMountains) to zăvelcă, boscea, pestelcă, fâstâc (Oltenia) to zadie (northern Transylvania, Maramureș) denotes narrow rectangular woolen aprons. 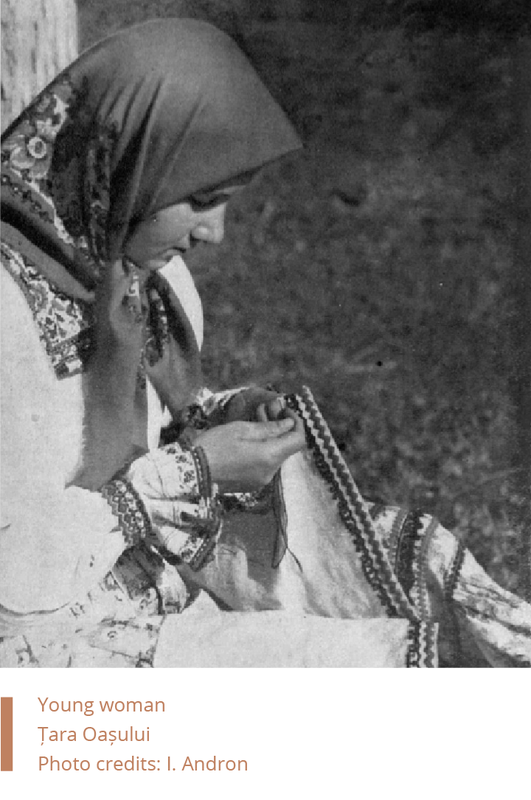 Hand woven and hand embroidered, they usually come in pairs, covering both the front and the rear – only young girls are allowed, in certain parts of Romania, to have only one catrință covering the front. 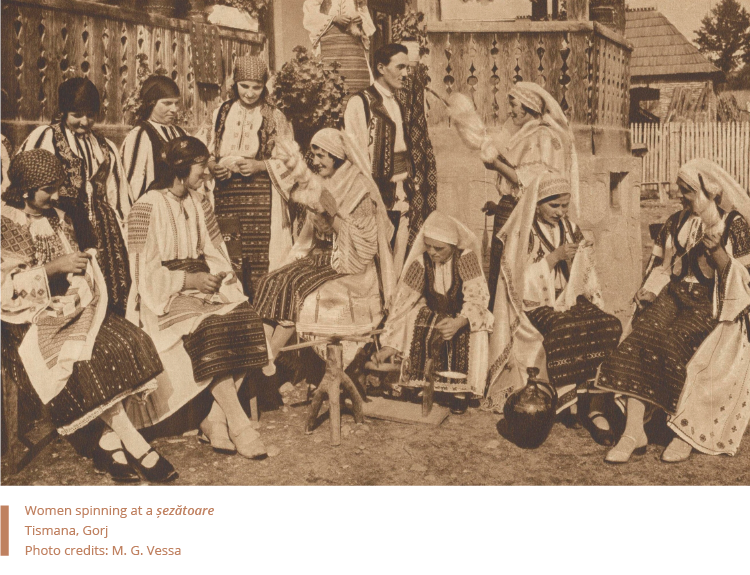 The catrințe are normally composed out of horizontal rows (vrâste), alternating between simple lines and lines with decorative embroideries. 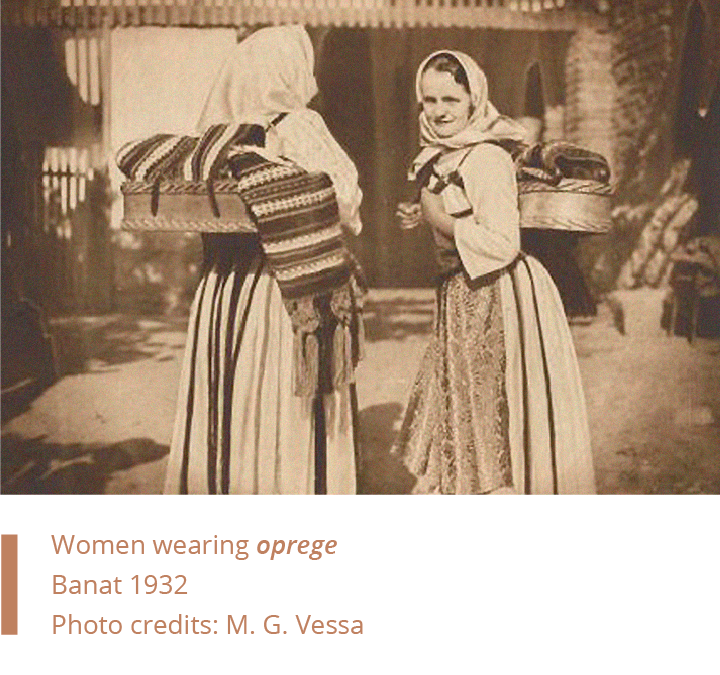 In the ethnographic zone of Oltenia, southern Romania, the aprons are brightly coloured with red, blue, green – whereas in Transylvanian villages they tend to be either black with golden embroidery or dark violet. 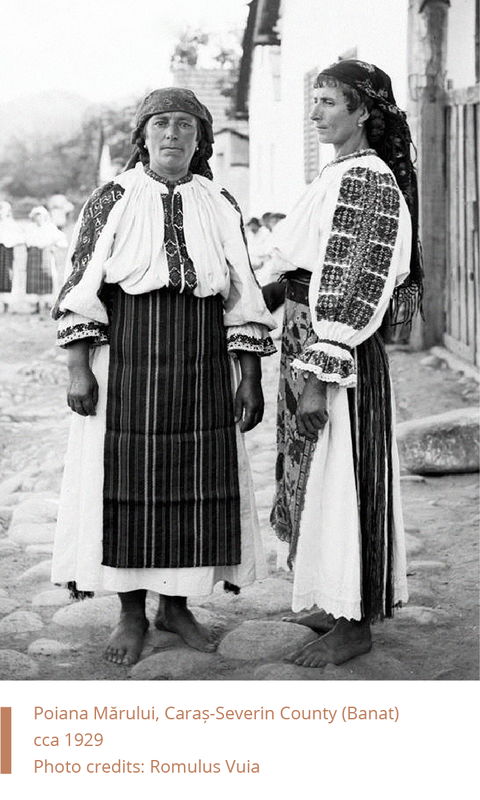 In Oltenia, the catrințe worn in the front and back follow certain rules: they come in pairs, one with horizontal stripes (catrințoi, opreg) and that is to be worn in the back, and the other with vertical stripes (fîstîc) – worn in the front. 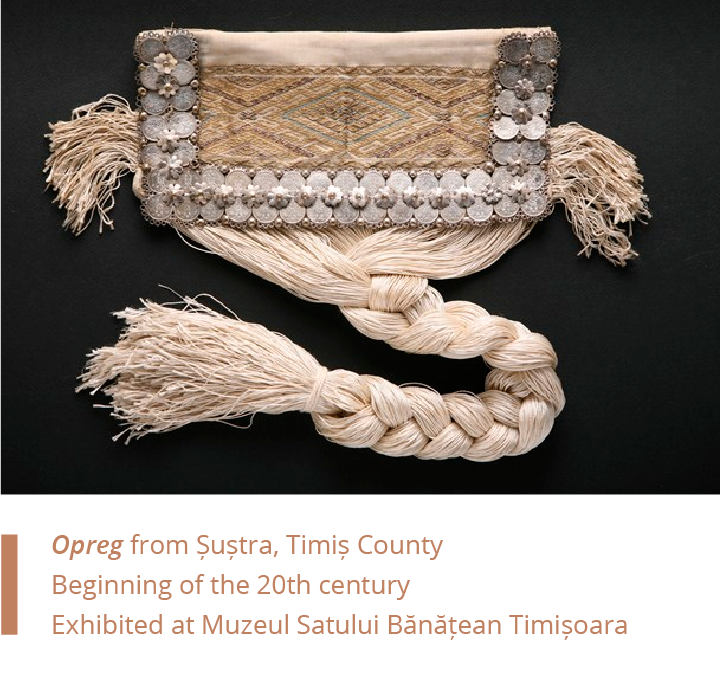 The opreg is a variation of the catrință, specific to the Banat area but extended to western parts of Oltenia as well as southern parts of Bihor (Crișana): it is a band (petec) with tassels (ciocoţi or chiţele) worn at the waist, either only at the back in combination with catrinta in the front, or both front and rear. 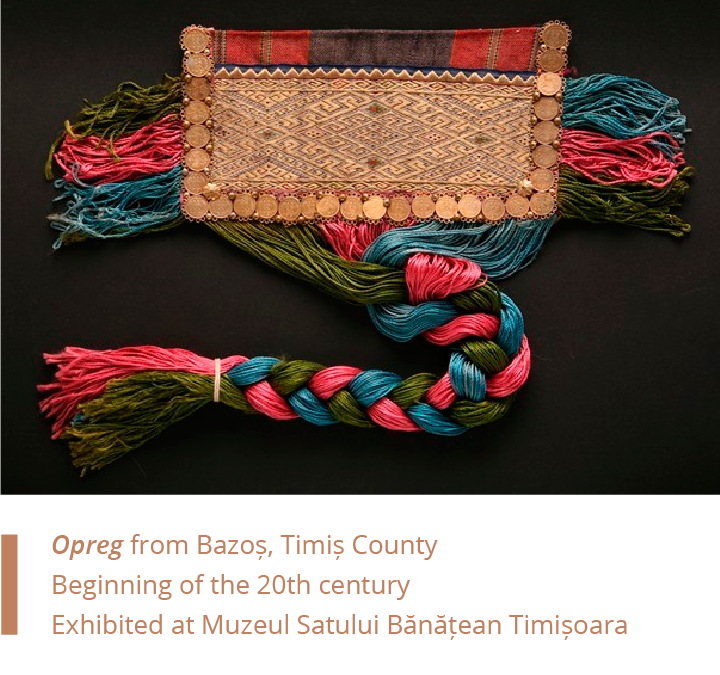 The length of the band is around 20-25 cm, and the tassels not longer than 80cm – metallic thread would often be used in the making of the opreg. 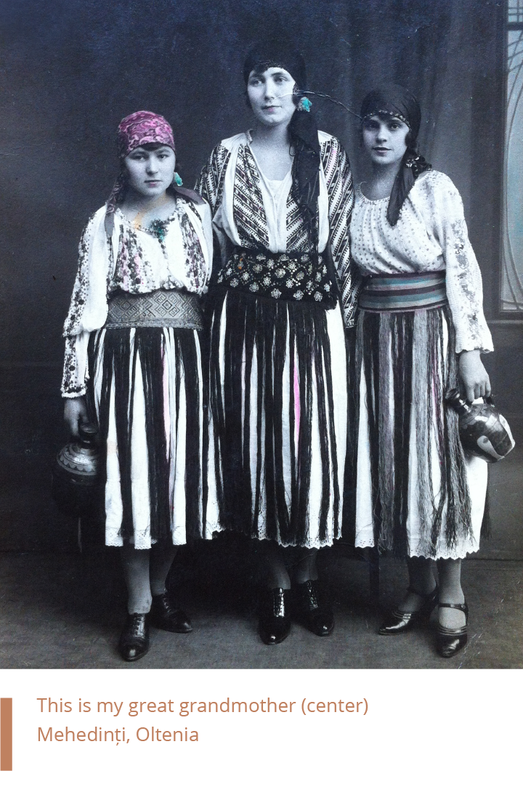 This is a photo of my great-grandmother posing with her sisters, all three wearing oprege, from Mehedinți (Oltenia) an ethnographic subzone bordering Banat. 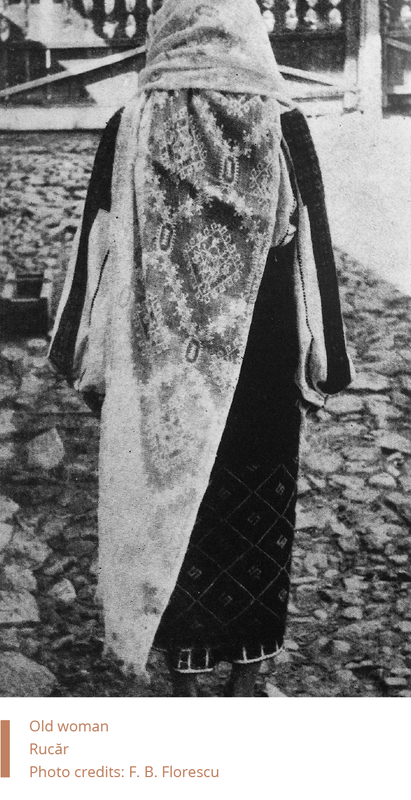 Wrap around skirt made out of a rectangular piece of hand woven fabric, worn at the waist, held in place with a woven belt (brâu) that covers the poale, the underskirt, leaving only the embroidered hem visible. 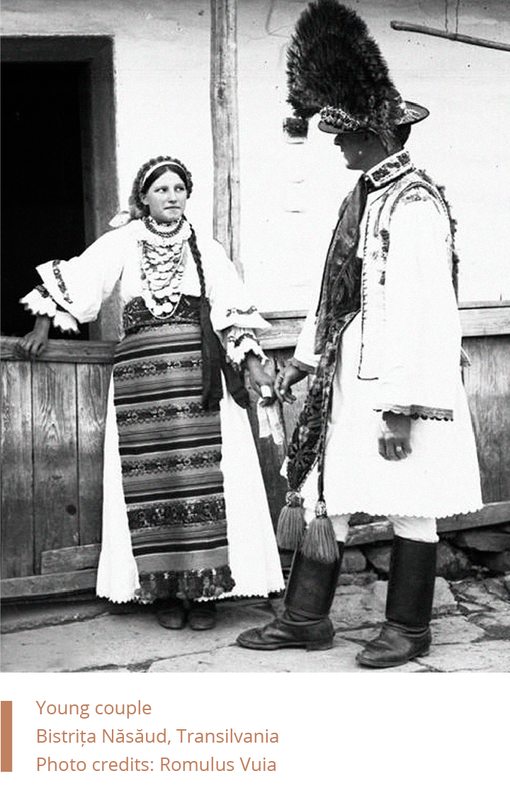 This type of skirt is particular to the ethnographic areas of the south and south eastern parts of Romania, namely Muntenia (Argeș and Muscel), Moldova, and in some parts of Oltenia, where it is worn in combination with catrințe. Fota is normally hand woven into the loom – made from woolen or a cotton and wool blend fabric. It is around 1.60 m long and 0.80 m wide. 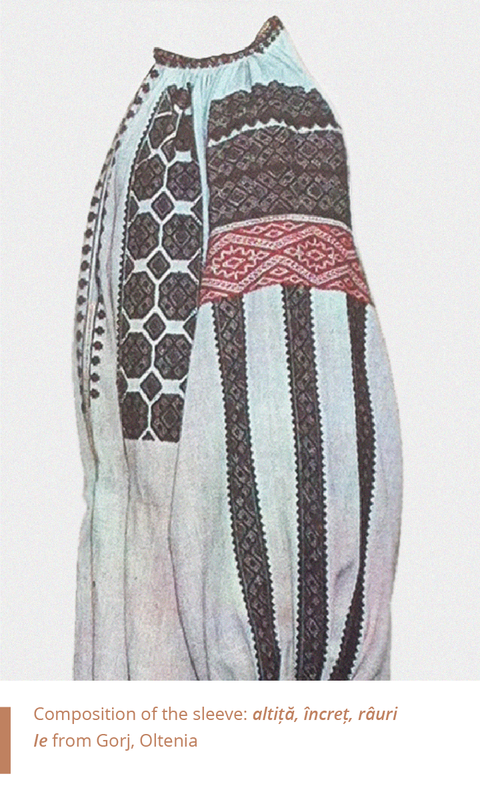 The type of fotă worn in Moldova is simple, dark coloured with vertical reddish stripes whereas the ones specific to Argeș and Muscel are heavily embroidered, at the beginning only around the lower edge of the skirt, but gradually covering the front side of the wrap as well – embroidered with gold and silver metallic thread. 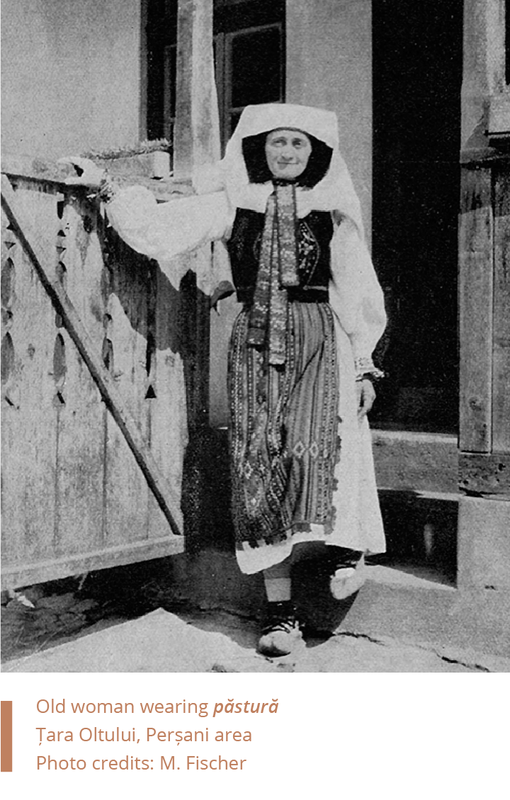 Pleated wrap around skirt – or pleated fotă, as it is sometimes described – the vâlnic is specific to the ethnographic region of Oltenia with its main subzones: Gorj, Dolj, Mehedinți, Romanați and Vâlcea. Vâlnicul goes by various local names, such as zăvelcă creață, opregul creț, crățana. Up to 4m long, gathered at the waist and held in place with a woven brâu, the vâlnic is decorated with narrow red vertical rows (vărgături). The vâlnic was particular to colder season and it was embraced by wealthier families. 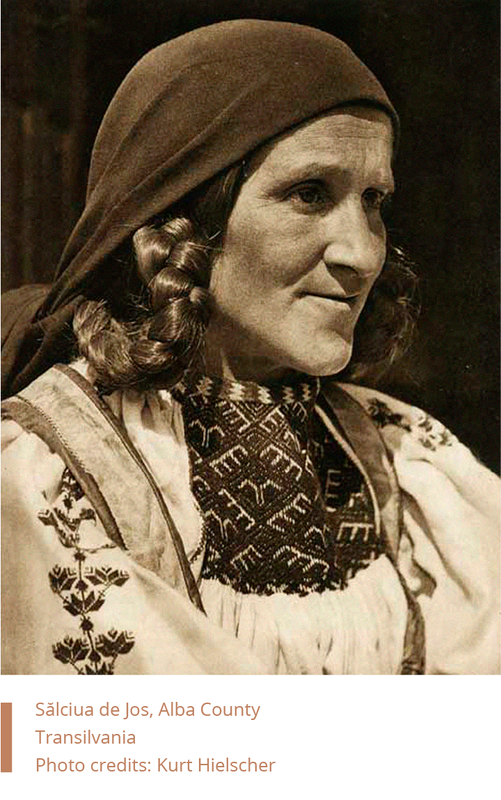 It was worn in combination with catrințe for a long time. A curious addition is a vâlnic referred to as the zăvelcă cu betea (apron with tinsel), present in the heart of the Oltenian ethnographic area, a black or dark violent pleated skirt with heavy metallic work at the lower end of the skirt. 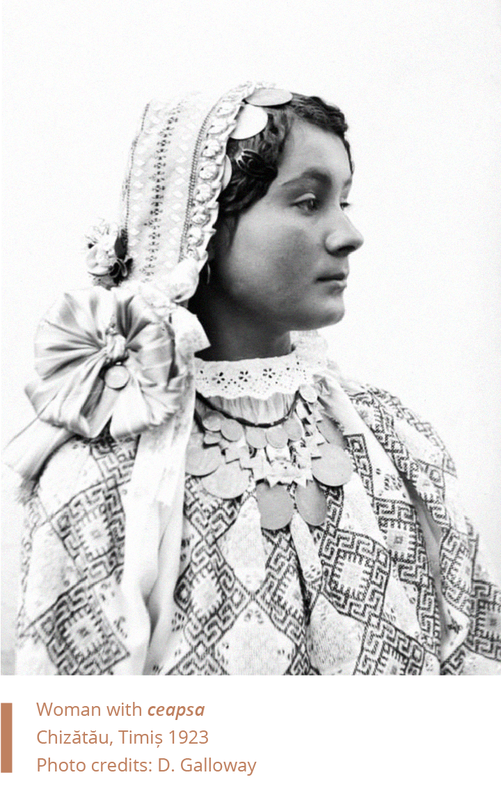 Headwear serves an important esthetic but also functional role: whilst it is usual for girls and young unmarried women alike to wear their head uncovered, braided in 2 tici or chici (or cover it with a head kerchief during the wintertime), it becomes mandatory to cover their head the moment they marry. 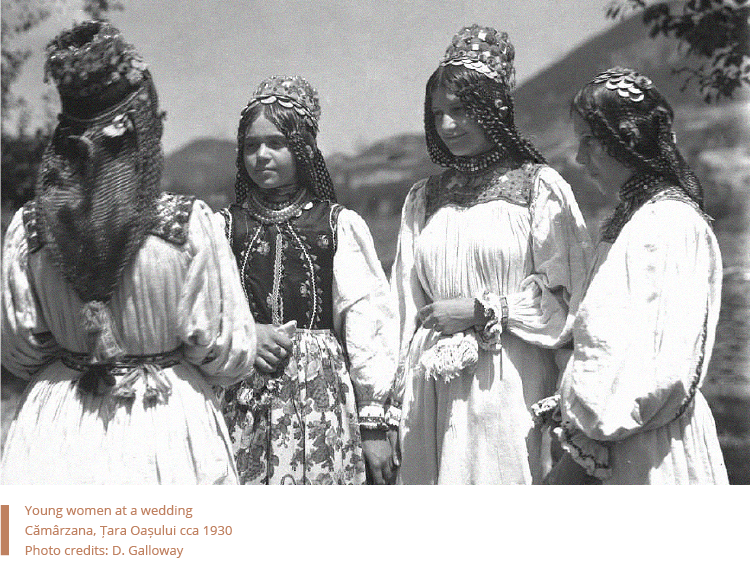 In a sense, it marks the symbolic rite of passage of girls passing into womanhood once married — and in most ethnographic regions, the setting on the headdress is considered a wedding ritual (for instance, the mother-in-law will wrap the bride’s head with a maramă). There are a plethora of designs of head dressings as well as intricate hair braidinsg — here are some of our favourite. Made out of hand woven raw silk called borangic, marama is a quintessential item in the traditional folk clothing specific to the ethnographic areas of southern and eastern Romania: Oltenia, northern Muntenia and Moldova. A maramă is up to 4 meters long and is always left to gently touch the ground to the back. It has hand woven silk floral and geometric motifs embroidered onto it using the loom, with a technique called alesătură: the silk thread is hand warped on the loom in the weaving process. Worn on top of what is called a caiță and fruntar. The black support is made out of gypsum and is referred to as the urechi (ears). 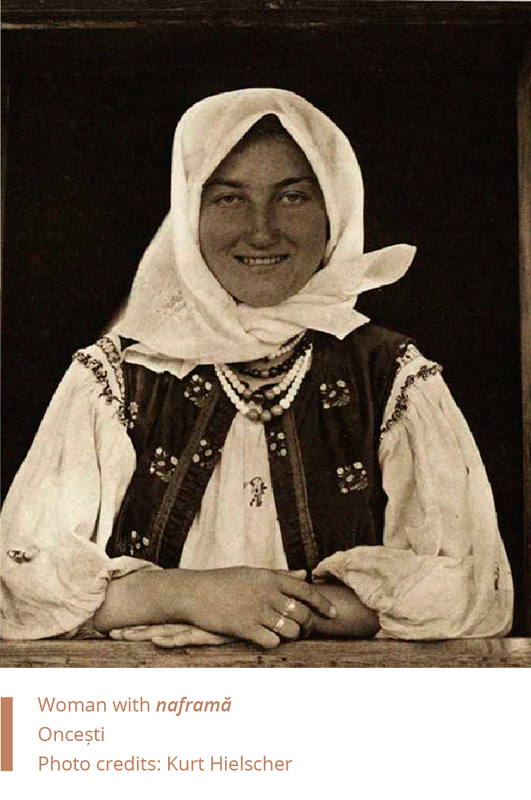 This type of headwear is specific to Tara Oltului and Tara Făgărașului, ethnographic areas in the south of Transylvania. 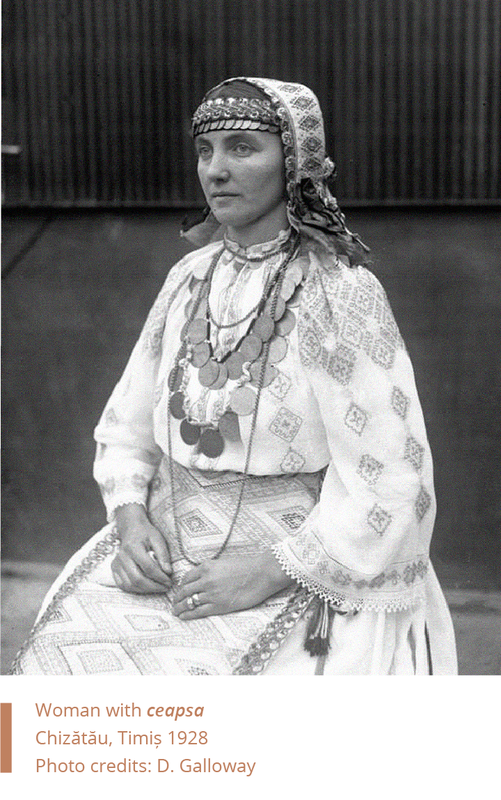 Headwear bonnet specific to the ethnographic area of Banat, western Romania. Always embroidered with golden or silver metallic thread with geometrical motifs. A variation is the conci cu monezi — the bonnet covered with coins, usually displayed at wedding ceremonies. The bride’s crown, specific to the wedding headdressing of Tara Oașului, northern Romania. 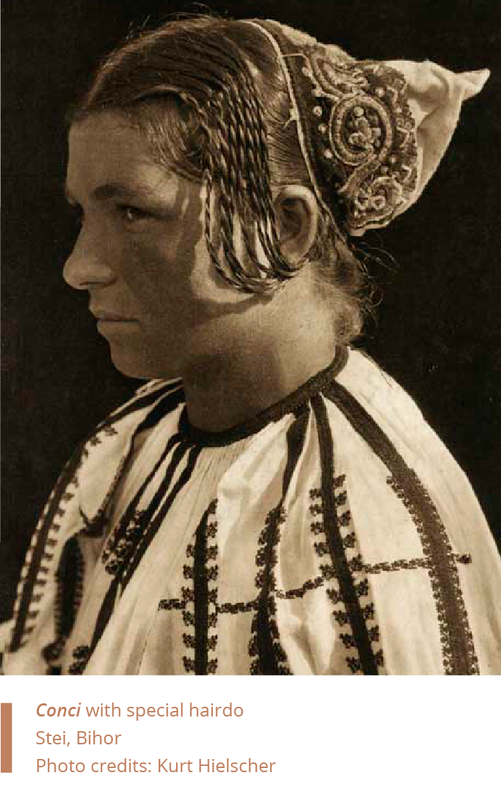 Headwear worn by a community called Pădureni, in Hunedoara county, Transylvania. Petrescu, P. Secosan, E. (1985) Le costume populaire roumain. Editura Meridiane: Bucuresti.